Arthur Harris, the son of George Steele Travers Harris and his wife, Caroline Harris, was born in Cheltenham, on 13th April, 1892 . His father was an engineer and architect in the Indian Civil Service. He was educated at Gore Court in Sittingbourne and Allhallows in Honiton, while his parents were in India. At the age of seventeen, against the wishes of his father, who wanted him to join the army, he went out to Rhodesia, where he tried his hand at goldmining, coach-driving, and farming. When the First World War broke out he joined the 1st Rhodesia Regiment and fought in the successful campaign to capture German South West Africa from the German Army. Harris returned to England in 1915 and with the help of an uncle joined the Royal Flying Corps. The following year he qualified as a fighter pilot and joined the 44 Squadron in France. Harris also helped organize the defence against the Zeppelin Air Raids in 1916 before taking command of the 44 Squadron and training it for night fighting. According to his biographer, Richard Overy: "Harris married, on 30 August 1916, Barbara Daisy Kyrle, the daughter of Lieutenant-Colonel Ernle William Kyrle Money, of the 85th King's Shropshire light infantry, with whom he had a son and two daughters... Posted to 70 squadron in France, he was invalided home after a crash, but he returned in May 1917 for fighter work with 45 squadron. Here he displayed many of his later qualities as a commander. He proved to be a cool and effective pilot and was attributed with five aerial victories. He constantly searched for ways to improve the tactical or technical performance of his squadron. He was also a strict officer, with high standards that he imposed on those around him." In 1919 Harris was given the rank of squadron leader of the recently created Royal Air Force (RAF). Over the next few years he served in India, Iraq and Iran. He led the 58 Squadron (1925-27) before serving on the air staff in the Middle East (1930-32). During this period the RAF used terror bombing, including gas attacks and delayed action bombs, on the Iraqi tribes rebelling against British rule. One RAF officer, Air Commodore Lional Charlton, resigned in 1924 after visiting a hospital that contained limbless civilian victims of these air raids. However, Harris remarked "the only thing the Arab understands is the heavy hand." 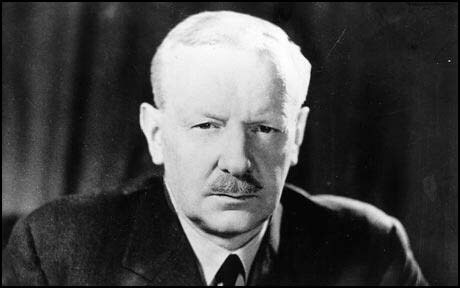 During 1928–9 Harris attended the Army Staff College at Camberley, where he was taught by, among others, Bernard Montgomery. He refused the offer to stay on as an instructor at the college, and was posted for two years to serve on the air staff in Cairo. In 1932 Harris was appointed commander of the 210 Flying Boat Squadron. Promoted to group captain in 1933 Harris was appointed deputy director of plans in the Air Ministry (1934-37). In this post he argued for the production of bombers that could reach the Soviet Union. Harris believed that communism was the main threat to Britain and was considered to be one of the earliest "cold war warriors". However, he believed that eventually Britain would go to war with Nazi Germany and correctly forecasted the starting date as 1939. By the outbreak of the Second World War Harris had reached the rank of air vice marshal and spent the early months of the war in the United States purchasing aircraft for the war effort. In November, 1940, Harris was appointed to serve under Charles Portal, the head of Bomber Command. In May 1941 Portal sent Harris back to the United States as head of the RAF delegation to try to speed up the supply of aircraft and engines from American industry, many of which had been on order since 1939. Harris found his relationship with the Americans difficult. He told friends that he disliked having to deal with "a people so arrogant" that they simply refused to listen to technical advice from the British. Harris also complained that they "are not going to fight" unless pushed into war. 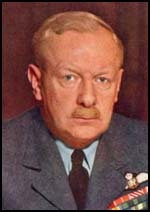 In February 1942, following the sacking of Air Chief Marshal Richard Pierse the previous month, Harris was recalled from Washington to be appointed commander-in-chief of Bomber Command. Richard Overy has argued: "The choice of Harris was recognition of his long experience, enormous capacity for work, organizational capabilities, and clear-mindedness. It also came despite his less flattering reputation as a man who spoke his mind bluntly, who would suffer fools not at all, and who had often in the past allowed his candour to get the better of his sense of responsibility. Though many in the Air Ministry regarded him as gruff and unapproachable, he was also able to inspire intense loyalty in those who served with him. The force of fewer than 400 operational bombers that Harris inherited had only a handful of the new four-engined aircraft, and was capable of only the most modest and inaccurate attacks on areas of western Germany." Arthur Harris claimed that his brief was "to focus attacks on the morale of the enemy civil population, and in particular, of the industrial workers". According to Richard K. Morris: "During March and April he had begun to experiment with attacks which concentrated bombers in time and space, to engulf radar-controlled flak and fighters, and overwhelm a city's fire-services. The force inherited by Harris was nevertheless too small to do this on any scale, and his efforts to increase it were being sapped both by losses and what he called the robbery of trained crews by other commands. 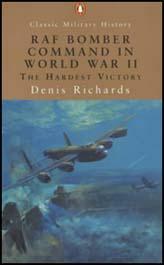 To make his case, Harris decided to gamble Bomber Command's reserves in an attack of unprecedented weight: a thousand aircraft against a single objective." On 20th May, 1942, Harris notified his group commanders of the plan and all leave was cancelled. Harris decided that the target should be Cologne. "The organisation of the force involved a tremendous amount of work throughout the Command. The training units put up 366 aircraft. No. 3 Group, with its conversion units put up about 250 aircraft, which was at that time regarded as a strong force in itself. Apart from four aircraft of Flying Training Command, the whole force of 1047 aircraft was provided by Bomber Command.... Nearly 900 aircraft attacked out of the total of 1047, and within an hour and a half dropped 1455 tons of bombs, two thirds of the whole load being incendiaries." Under his leadership the policy of area bombing (known in Germany as terror bombing) was developed. Harris argued that the main objectives of night-time blanket bombing of urban areas was to undermine the morale of the civilian population and attacks were launched on Hamburg, Berlin, Cologne, Dresden and other German cities. This air campaign killed an estimated 600,000 civilians and destroyed or seriously damaged some six million homes. It was a highly dangerous strategy and during the war Bomber Command had 57,143 men killed. In March, 1945, Winston Churchill gave instructions to Harris to bring an end to area bombing. As he explained: "It seems to me that the moment has come when the question of bombing of German cities simply for the sake of increasing the terror, should be reviewed. Otherwise we shall come into control of an utterly ruined land." As Richard Overy pointed out: "Harris reacted angrily to the charge by arguing that he had 'never gone in for terror bombing’ and that city bombing was still justified in order to speed up surrender and avoid further allied casualties. He had already crossed swords with the chief of air staff, Portal, in December 1944, over his preference for city attacks over attacks on specific target systems. The new arguments angered and puzzled him." Harris became a marshal of the Royal Air Force in 1946 and soon afterwards retired from active duty. He published his war memoirs, Bomber Command, in 1947. Upset by criticisms of his bombing strategy during the Second World War he went to live in South Africa where he ran a shipping line, the South African Marine Corporation. When Winston Churchill became prime minister again in 1951 Harris was asked if he wanted a peerage, but he refused. In January 1953 he accepted a baronetcy instead. In the 1960s public opinion turned against Harris and he was viewed by many as a "war criminal" because of his area bombing strategy. When it was decided to erect a statue to Harris to stand next to Hugh Dowding outside the RAF church of St Clement Danes in the Strand in London, there were widespread objections. Arthur Harris died at his home in Goring-on-Thames on 5th April, 1984. (1) In his autobiography Arthur Harris explained why he joined the Royal Flying Corps in 1915. The Gunners were full up. I thought I would learn to fly; even before the war I had toyed with the idea of joining the R.N.A.S. and might have done so if it had not meant becoming a professional sailor. I therefore joined the R.F.C. To me it was just an incident pending the suppression of the Boche and the chance to get backhome to Africa. I certainly had no idea that air warfare would be my life's work. I had an uncle on Kitchener's staff so I slid round the 6000 "waiting list" - it was sheer nepotism. I was appointed a second-lieutenant on probation, and learned to fly. During the war I had two main jobs. I formed and commanded a detached flight-and later a squadron - in the first Home Defence squadron of night fighters - in which Leefe Robinson shot down the first Zeppelin - and in France I commanded a flight in a fighter squadron protecting our artillery spotters. (2) While studying at the Army Staff College in 1927Arthur Harris got into trouble when he criticised his lecturer for his conservative views on military tactics. I remember getting into hot water when I was asked in my turn, after a week's intensive study of tank warfare (and this at a time when the army had just got rid of the Tank Corps) to give my opinion of the week's work. I included in my answer a remark to the effect that, after I had watched the army mind at work disposing of the tank as a useless thing because it could not do exactly what the cavalryman and his horse had always done and in precisely the same way, I was sure the army would never succeed in choosing a tank that would meet all their requirements until somebody invented tanks that ate hay and thereafter made noises like a horse. During peace-time the enormous organisation and the large number of airfields and aircraft needed to train an adequate number of crews up to operational standards could not be provided within the limits of the endurance of the British tax-payer. Flying Training Command and the Empire Training Scheme provided us with recruits trained up to a certain standard, but very far from being fit for operations; for one thing, none of these men had yet been trained to work together as a bomber crew. This was all right when we had bombers, such as the Battles, Hinds, and Vickers Wellesleys, which usually had only a crew of two, but with the newer types, carrying crews of four, five and six, such training of the men as .individuals was wholly inadequate. All the rest had to be done by Bomber Command itself, and there had been no provision for such training in peace-time outside the squadrons themselves-which in war could not undertake both training and operations. (4) While in India in the 1920s Basil Embry served under Arthur Harris. He wrote about Harris in his autobiography, Mission Completed (1956). Harris turned his attention to the administrative and disciplinary side of squadron life. He improved the airmen's food by attention to detail, he lowered the temperature in barrack rooms by installing a device which sprayed water on to matting hung over each window, and he reorganized the officers' mess and had it redecorated. He also tightened up discipline, which had become a little lax in the carefree existence of life in an undeveloped country. A daily parade was held and young officers were made to carry out regular physical training. These measures were unpopular with some, but that influenced him not at all in driving forward to build up the efficiency he demanded. Harris paid great attention to training in airmanship, and insisted that pilots attend lectures and had technical instruction in the workshops. Every squadron activity he watched with keen personal interest and the effects of his policy and strong personality were soon felt throughout the unit. Morale soared, esprit de corps rose to a great height and each member of his unit was proud to say, "I belong to 45 Squadron!" The Germans never make a small mistake, because they are cautioned against all small mistakes in their manuals, without reference to which they seldom do anything whatever. But they can always be relied upon to make all the imaginable large and catastrophic mistakes, together with a good many that only a German could think out. No one but a German would have thought of attacking Russia quite needlessly before the rest of the world had been finished off. Nobody but the Germans would have thought themselves so clever at designing aeroplanes that they could afford to use almost unarmed bombers against us; they never grasped the simple fact that even a bad fighter is bound to catch the average bomber. The raid on Mainz early in August introduced him (Leonard Cheshire) unceremoniously to the growing hazards of the area-bombing campaign on which Harris had embarked with bleak determination. Having established in the early summer that a whole city could be set on fire from end to end by concentrating the biggest force available over the target in the shortest possible time, the Chief of Bomber Command brusquely refused to sit pretty until the British aircraft industry overtook his many needs. The results of his gigantic gamble had silenced the sceptics in high places as effectively as the unwelcome evidence of night photography had silenced the optimists in 1941. (7) Donald Bennett was appointed commander of Pathfinders on 5th July 1942. In his autobiography he recorded how Arthur Harris was against the creation of this new force. (8) Arthur Harris launched the first thousand-bomber raid on Nazi Germany on 30th May 1942. He eventually selected Cologne as the target of his attack. We made our preparations for the thousand bomber attack during May; it had the code word "Millenium". The organisation of the force involved a tremendous amount of work throughout the Command. The training units put up 366 aircraft. No. 3 Group, with its conversion units put up about 250 aircraft, which was at that time regarded as a strong force in itself. Apart from four aircraft of Flying Training Command, the whole force of 1047 aircraft was provided by Bomber Command. Nearly 900 aircraft attacked out of the total of 1047, and within an hour and a half dropped 1455 tons of bombs, two thirds of the whole load being incendiaries. The casualty rate was 3.3 per cent, with 39 aircraft missing, and, in spite of the fact that a large part of the force consisted of semi-trained crews and that many more fighters were airborne than usual, this was considerably less than the average 4.6 per cent for operations in similar weather during the previous twelve months. The medium bomber had a casualty rate of 4.5 per cent, which was remarkable, but it was still more remarkable that we lost scarcely any of the 300 heavy bombers that took part in this operation; the casualty rate for the heavies was only 1.9 per cent. These had attacked after the medium bombers, when the defences had been to some extent beaten down, and in greater concentration than was possible for the new crews in the medium bombers. The figures proved conclusively that the enemy's fighters and flak had been effectively saturated; an analysis of all reports on the attack showed that the enemy's radar location devices had been able to pick up single aircraft and follow them throughout the attack, but that the guns had been unable to engage more than a small proportion of the large concentration of aircraft. The strategic consequences of bombing Germany may be summed up in a few simple figures; in 1941, when the Germans invaded Russia the German army had the support of well over 50 per cent of the whole German air force. At the end of 1943, the German army had the support of less than 20 per cent of the whole German air force. And this change was the result of decisions made by the enemy in the summer of 1942; the decisions were forced upon him by Cologne and by the new threat of daylight operations over Germany by American heavy bombers. In my mind there is no doubt whatsoever that the main reason for the speed and efficiency with which the Americans get things done in war is simply because America has no civil service that can interfere. In the American fighting services they ask for the money they want as a lump sum, or for the aircraft they want as a round number, and once they get either of these they can do what they please with them, equipping or modifying their aircraft according to their own ideas. In war no system that makes for delay is tolerable. After thirty years experience of working under the dead hand of the Civil Service, I am persuaded that the progressive multiplication of government regulations and controls, operated by civil servants who themselves are multiplying fast, is leading the country to catastrophe, complete, and perhaps irreparable. I have the greatest admiration for the integrity, ability, and immense capacity for grinding and often monotonous work which is indeed the hall-mark of the British civil servant. I have none whatever for the results, which have to be experienced to be believed, that he achieves in times of urgent national emergency. (11) After the Second World War Arthur Harris came under attack for the bombing raid on Dresden. In his autobiography he explained why he ordered the bombing of the city in February, 1945. With the German army on the frontiers of Germany we quickly set up GH and Oboe ground stations close behind the front line and this ensured the success of attacks on many distant objectives when the weather would otherwise have prevented us from finding the target. At the same time the bombers could fly with comparative safety even to targets as distant as Dresden or Chemnitz, which I had not ventured to attack before, because the enemy had lost his early warning system and the whole fighter defence of Germany could therefore generally be out-manoeuvred. In February of 1945, with the Russian army threatening the heart of Saxony, I was called upon to attack Dresden; this was considered a target of the first importance for the offensive on the Eastern front. Dresden had by this time become the main centre of communications for the defence of Germany on the southern half of the Eastern front and it was considered that a heavy air attack would disorganise these communications and also make Dresden useless as a controlling centre for the defence. 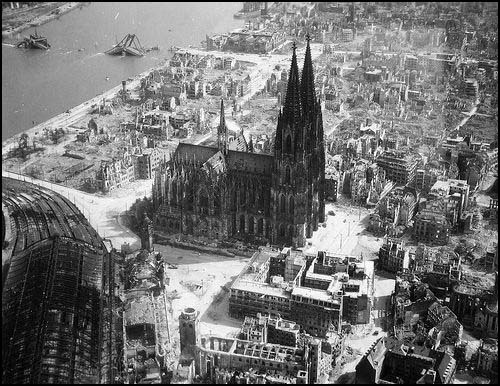 It was also by far the largest city in Germany-the pre-war population was 630,000 which had been left intact; it had never before been bombed. As a large centre of war industry it was also of the highest importance. An attack on the night of February 13th-14th by just over 800 aircraft, bombing in two sections in order to get the night fighters dispersed and grounded before the second attack, was almost as overwhelming in its effect as the Battle of Hamburg, though the area of devastation -1600 acres - was considerably less; there was, it appears, a fire-typhoon, and the effect on German morale, not only in Dresden but in far distant parts of the country, was extremely serious. The Americans carried out two light attacks in daylight on the next two days. I know that the destruction of so large and splendid a city at this late stage of the war was considered unnecessary even by a good many people who admit that our earlier attacks were as fully justified as any other operation of war. Here I will only say that the attack on Dresden was at the time considered a military necessity by much more important people than myself, and that if their judgment was right the same arguments must apply that I have set out in an earlier chapter in which I said what I think about the ethics of bombing as a whole. In spite of all that happened at Hamburg, bombing proved a comparatively humane method. For one thing, it saved the flower of the youth of this country and of our allies from being mown down by the military in the field, as it was in Flanders in the war of 1914-1918. But the point is often made that bombing is specially wicked because it causes casualties among civilians. This is true, but then all wars have caused casualties among civilians. For instance, after the last war the British Government issued a White Paper in which it was estimated that our blockade of Germany had caused nearly 800,000 deaths-naturally these were mainly of women and children and old people because at all costs the enemy had had to keep his fighting men adequately fed, so that most of what food there was went to them. This was a death-rate much in excess of the ambition of even the most ruthless exponents of air frightfulness. It is not easy to estimate what in effect were the casualties caused by allied bombing in Germany because the German records were incomplete and often unreliable, but the Americans have put the number of deaths at 305,000. There is no estimate of how many of these were women and children, but there was no reason why bombing, like the blockade, should fall most heavily on women and children; on the contrary, the Germans carried out large schemes of evacuation, especially of children, from the main industrial cities. Whenever the fact that our aircraft occasionally killed women and children is cast in my teeth I always produce this example of the blockade, although there are endless others to be got from the wars of the past. I never forget, as so many do, that in all normal warfare of the past, and of the not distant past, it was the common practice to besiege cities and, if they refused to surrender when called upon with due formality to do so, every living thing in them was in the end put to the sword. Even in the more civilized times of today the siege of cities, accompanied by the bombardment of the city as a whole, is still a normal practice; in no circumstances were women and children allowed to pass out of the city, because their presence in it and their consumption of food would inevitably hasten the end of the siege. And as to bombardment, what city in what war has ever failed to receive the maximum bombardment from all enemy artillery within range so long as it has continued resistance?